No one wants to deal with blackheads, but they’re a reality for many of us, at least at some time in our lives, and they can be frustratingly stubborn to remove! Knowing what causes blackheads is the first step toward being able to eliminate them so you can enjoy clear, even-toned skin. Why do some people with oily skin have few to no blackheads? Although excess oil is a causative factor, the pore lining is a factor as well. When the pore lining becomes damaged, misshapen, or is just smaller than normal, it makes it much easier for clogs to form. Knowing what causes blackheads is essential to eliminating them, but it’s also important to know the truth behind some common myths and misunderstandings about blackheads. 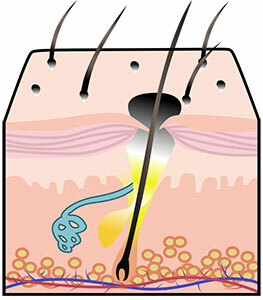 First, blackheads are not caused by skin being dirty. That’s why washing your face in an effort to cleanse skin of blackheads won’t work. Cleansing will help remove excess surface oil, but a cleanser can’t reach farther into the pores where the blackheads are rooted. Blackheads can’t be scrubbed away. So why do several cosmetics lines sell blackhead scrubs promising just that? Good question! Although scrubs can help remove the uppermost visible portion of a blackhead, they don’t address what’s going on in the pore lining where the blackheads form. That’s why, when you scrub blackheads, the dark dots show up again shortly afterward. You can get blackheads even if you have dry skin. This sounds counter-intuitive, but even someone with dry skin may still see blackheads, especially on the nose. The reason is that the nose has more oil glands than any other part of the face, and excess oil is a key component in the formation of blackheads. You can have blackheads without acne. Although most people with acne also struggle with blackheads, it’s possible to have just blackheads, without any other type of breakout. Now that you know what causes blackheads, find out how to get rid of blackheads, including information on the best way to remove blackheads yourself.